Andrew Kliman is Professor of Economics at Pace University New York, and a strong defender of Karl Marx. Kliman is especially committed to Marx’s discovery that underlying contradictions at the heart of the capitalist production give rise to the law of the tendency of the rate of profit to fall. As Kliman ably demonstrates, the operation of this law is inseparably connected to a variety of means – including the use of credit and debt – which are used to overcome it. When these fail, crisis erupts, credit is used even more liberally to overcome it, albeit temporarily, until it too fails. The necessary destruction of capital follows – first by reducing value and then by physical elimination. When surplus productive capacity has been destroyed sufficient to restore a profitable ratio of employed labour to fixed investment, growth can restart, although from a much lower base than before. 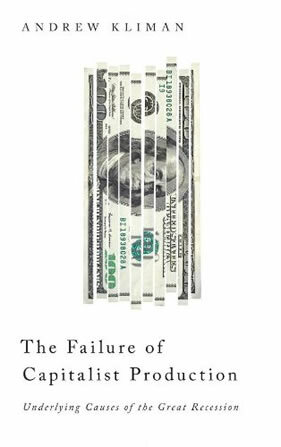 By painstakingly seeking out reliable economic measures, combined with a scientifically rigorous analysis and an ability to tell his story to an informed if less technically equipped audience, Kliman has earned a deserved reputation. The book as a whole is a remarkably convincing piece of work. But even jewels have their flaws, and Kliman’s analysis is no exception. Kliman argues that the only sufficiently reliable statistics available are those relating to the activities of corporations operating on the soil of the United States. So whilst that includes corporations based abroad but carrying out business in the US, it excludes the business transacted in other countries by US-based firms. To be precise, Kliman’s strictly empirical methodology limits his analysis to corporate activity in the US. And, as he admits, this is at odds with Marx’s concept of the totality of social capital which today is spread across the globe by corporations in a constant search for ever cheaper, more easily exploitable labour. So there’s a constant tension between Kliman’s laboratory-style study of just a part of the US economy – even allowing that it remains the largest – and the larger reality of the world economy dominated by 200 or so global corporations. When Kliman talks about the “financial crisis, the Panic of 2008, and the Great Recession to which they led”, apart from an early three-page digression into global financial instability, he's really only talking about the US. But given that the US remains the country with largest national economy, it may be reasonable to suspend misgivings and accept that the principles of the arguments can be generalised to the world economy as whole. Within these limits, then, there are some very valuable conclusions drawn, even though the way that Kliman pursues his targets can be somewhat one-sided as a consequence. The value comes from his determination to challenge, undermine and refute some of the main streams of economic thought of the last four decades, including those that claim to be Marxist as well as those against. Kliman lays into those who argue that the rise of neo-liberal ideology with the inauguration of Richard Nixon as president in 1968 was responsible for the current crisis. He shows that the underlying problems were already making themselves felt from the late 1960s, leading to long period of relative stagnation from the 1970s. There's no attempt at an explanation for the emergence of neo-liberalism, despite its well-documented catastrophic impact on the lives and economies of people throughout the world from the 1980s onwards. Kliman's insistence on empirically-tested rigour clearly reveals the objectivity of the contradictory development of capital, despite this shortcoming with respect to the equal necessity of its subjective expression in the return of the sharp-shooting, deregulating free marketeers. The methodological sleight-of-hand used by those who have argued that the performance of the post-war economy proved Marx wrong on the falling rate of profit receives a well-justified battering. Like an economic superhero Kliman demolishes a generation of economists brought up on Baran and Sweezy's 1966 Monopoly Capital and wedded to the idea that economic weakness can be attributed to “underconsumption”, that people just aren't buying enough stuff. There's a convincing, and refreshing assault on the multitude of writers who've alleged that the financial sector became uncoupled from the real economy. This latter argument should and could be a major blow to the “blame-the-bankers” school who have diverted attention from the contradictions within the system of production itself. But Kliman's which-came-first explanation stops short of an investigation into the dialectical inter-dependence of productive and finance capital despite his introductory overview of Marx's explanation of the role of the credit system. This, combined with the US-focussed myopia is a shortcoming that leads to an underestimation of the scale of the global crisis and a virtual blindness to the disintegration gripping Europe.